Are you ready for some stitching this year? Throughout 2019 I'm releasing a free pattern a month for my latest Wild Olive Stitching Club. This time, it's the Jam of the Month Stitching Club! I've hosted a variety of paid stitching clubs, and those will still come around occasionally, but I like letting everyone join in with no pressure. It's also less pressure on me, because while I'll make sure you get a pattern each month, I let the schedule be a little more relaxed. Check back each month for your freebie, or follow me on Instagram or Twitter, where I'll always post when a new pattern comes out. 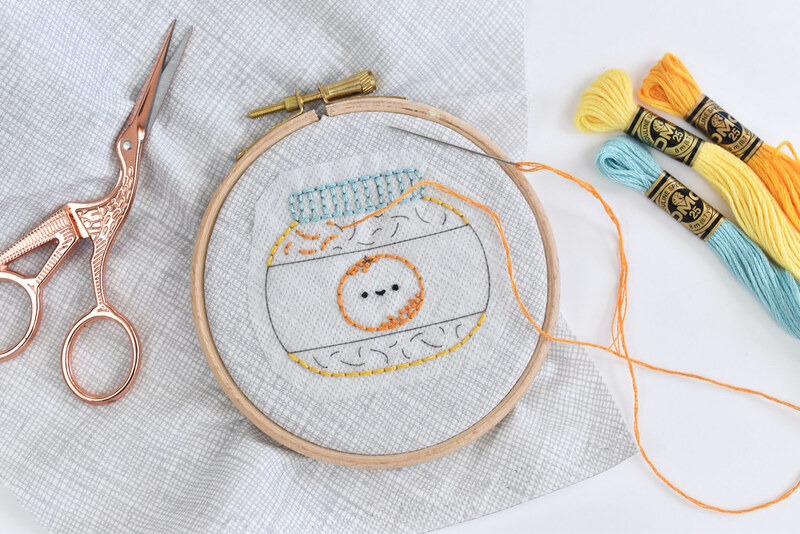 The Jam of the Month Stitching Club is more than just embroidery. First, I'll be sharing a fun EPP mini quilt project to make with the 12 patterns coming your way. The printable paper templates and layout are coming in a day or two. Plus, I had a request for cross stitch patterns too, and why not? Those will release separately from the embroidery patterns and will be their own growing chart. Yay! I do hope you'll stitch some jam with me each month! I'm really excited about this (and some other jelly, preserves, and compotes I'm concocting!). When you stitch and share photos, be sure to use the tag #wildolivestitchingclub and tag me too! I'm @molliejohanson on Twitter and Instagram. Finally, as I mentioned, this is a free stitching club, open to anyone. I LOVE sharing free patterns, projects, and printables, and I can't imagine ever stopping. I also wanted to make a way for you to support me and the freebies I share. So if you're so inclined, I made a way for you to "buy me a coffee" (kind of like leaving a tip!). No pressure though, okay? Está precioso!!! Me enamoré de tu frasco de mermelada desde que nos compartiste los calendarios. Gracias por compartir. Recibe un abrazo venezolano! What is the material the pattern is printed on? It's Sulky Sticky Fabri-Solvy. You can print the pattern on it, then after you finish stitching it dissolves in water!